Within the sorrow at the passing of the Lubavitcher Rebbe, Rabbi Menachem Mendel Schneerson, lies a deep and everlasting gratitude for all that he inspired and inspires in the lives of his followers and in his work. The Rebbe, who was born in Nikolaef, Russia, studied at the University of Berlin and at the Sorbonne in Paris. He escaped the Nazis to arrive in the United States in 1941. He assumed the leadership of the Brooklyn based Chabad Lubavitch movement in 1950. It is today a center of more than 2000 educational, social and rehabilitative institutions touching millions of people from all walks of life in every part of the world. The first institution created by the Rebbe was Tzerei Agudat Chabad, the Chabad Youth Organization in Israel. 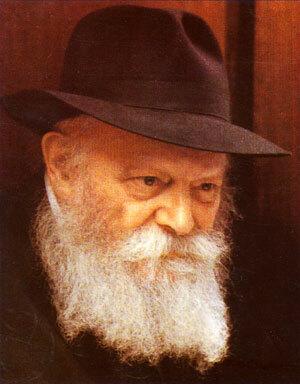 His tremendous love and concern for the people of Israel, particularly the school aged children who would grow to be its future leaders and citizens, inspired the founding of an organization that today, because of the Rebbe's blessing, supports over 195 Chabad Houses throughout Israel and dozens of institutions that serve Israeli's from every walk of life. No Jew falls outside the Rebbe's embrace. And the Rebbe falls within the embrace of most every Jew in Israel. His picture hangs in the windshields of cab drivers, behind the counters of street corner pubs and fast food stands; his visage is tucked in the corner of barber shop mirrors, selflessly gazing back at patrons as they vainly examine their newly coiffed hair. School children know that the Rebbe remembered their birthdays, and expectant mothers carry his picture with them to the hospital, to assure the welfare of their newborns and of themselves. The Rebbe has elevated the Israeli soldier to the level of tzadik, a righteous person risking his life for the protection of another Jew. He sent his Shiuchim into battlefields and remote army posts to care for the physical and spiritual needs of these brave defenders of Israel. And their widows and orphans are remembered many times each year with special programs instituted by the Rebbe. The elderly and the immigrant; the drug addict and prisoner; the statesman and scholar; all fell under the Rebbe's concern,; all have benefited from the Rebbe's programs and guidance. A child cries out. And though the Rebbe's schedule is crammed with the work of running the largest Jewish organization in the world, with the task of answering thousands of letters and requests, with the burden of responding to the needs and requests of politicians and heads of state, of preparing his sermons, he stops everything to listen to this cry and to respond. In 1990, parents of the Chernobyl children began a desperate search for help. Their request was beyond the bounds of every Jewish organization to which they turned. In truth, the burden which their pleas contained exceeded the capacity of Chabad to fulfill. Or so it was thought. Chabad could not afford the task. It had no system in place to deal with the problem. Nothing was known about delivering medical care to irradiated children. It seemed beyond their capability. But the parents persisted, and finally, their request found its way to the Lubavitcher Rebbe. The Rebbe did not hesitate. A Jewish child was in danger. A Jewish parent needed help. And the Rebbe said "Yes". He wrote a letter to Chabad in Israel with one simple, clear directive: "Take responsibility for the Chernobyl children," he said. "Bring them to Israel." The Rebbe knew full well what his directive would mean to an already overburdened staff, to a bank account already stretched almost beyond its capacity. But he also knew that a Jewish child was in danger. And this he could not tolerate. When finally the children arrived safely in Israel, the Rebbe sent a communiqué: "When are you bringing the next flight?" he asked. Words of praise had been expected for a difficult job well done. But again the Rebbe was concerned with only one thing: the cry of another Jewish child, one still left behind in the contaminated lands of Belarus and Ukraine. One after the other they came. Young frail children, who just hours before bade farewell to families and friends, bicycles and play- mates. Sent by their parents who feared for the lives of their children, they stepped from the plane led by a Chabad guide to places where they devoured bags of candy, fruits and juices. Eventually they will be reunited with parents and other family members in Israel. On June 5th, 1994, the 1001st child rescued by the Chabad's Children of Chernobyl Project arrived to a dramatic airport welcome. Celebration 1001 and beyond exceeded the wildest dreams. "The most memorial arrival I have ever attended" were the words of the Chief Rabbi of Israel. And the children are still coming, and their parents are now arriving and families are being united. This is the Rebbe's greatness: he loved and he inspired others to love. He cared, and he inspired others to care. He had great faith that the Almighty would provide all the resources necessary to do His will, and he transmitted this faith to others. He had, above all, great confidence in the Jewish people-in the Godly nature of the Jewish people. The Rebbe knew that this nature, filled with compassion and generosity, would break through the chains of self-centeredness when faced with the challenge to save the life of another Jew especially a child. As always, the Rebbe was right. When Iraqi scuds rained down terror on Israel during the Gulf War, people clamored to the Rebbe for his wisdom and advice. His words of assurance and encouragement and predictions were that everything would turn out well and that Israel would be protected. As usual, the Rebbe was correct. The group assembled in the caucus room of the Russell Senate Office Building in Washington last August witnessed the awarding of Congressional Gold Medal to the late Rabbi Menachem Mendel Schneerson. Bronze duplicates became available from the United States Mint on June 28th, the day of International Tribute marking the one year anniversary of his death at the age of 92. Mint Sculptor-Engraver John Mercanti designed the obverse of the Congressional Medal, which is a portrait of the Rabbi in incused lines rather than the traditional relief. 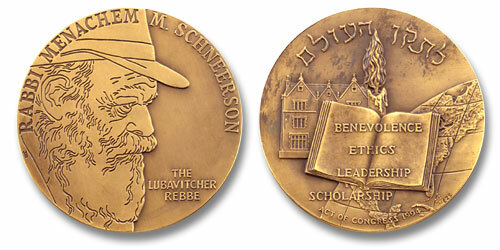 The inscription RABBI MENACHEM is incused while M. SCHNEERSON and THE LUBAVITCHER REBBE are raised. Mint Sculptor Engraver Edgar Z. Steever IV executed the reverse which was based on a sketch by professional illustrator John Payne. The reverse features a book which represents study and contains the inscription BENEVOLENCE/ ETHICS; LEADERSHIP/ SCHOLARSHIP. The torch represents enlightenment and the globe represents world education. The rabbi's home in Brooklyn is in the background of the reverse. The Hebrew inscription reads "To improve the home." Some would question the highly unusual resolution of the United States Government to posthumously award a Congressional Medal to a leader of a religious sect. But then, the Rebbe was a most unusual person.